The RV 770 is made for the RV’er with many features added to aid in not only your safer travel, but also for selecting your next destination as well as anything you may need along the way. 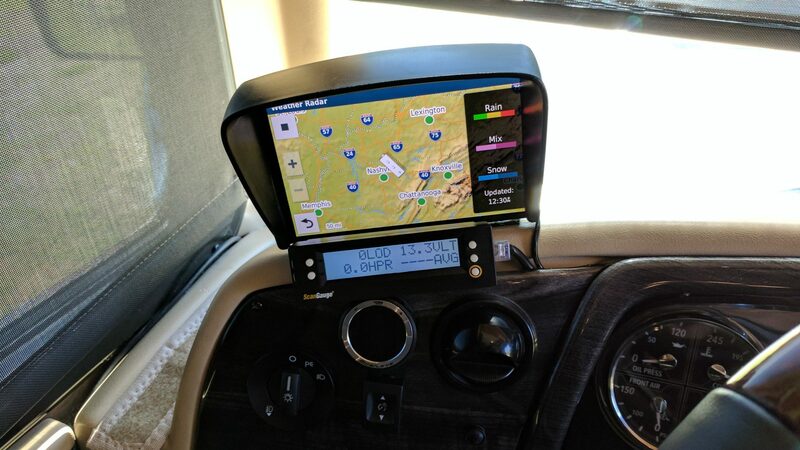 You start off by inputing your RV size and weight information of your motorhome or towable trailer, and then RV 770 LMT-S will use this information to find the directions you need. The route will be determined based on the height, weight, length and even width of your RV or motorhome. RV 770 LMT-S has a full and comprehensive list of RV Parks as well as Services. This listing of RV parks and campgrounds contains nearly 20,000 sites in the U.S. and Canada! This also includes national and state parks. You can easily search this directory by anything such as preferred amenities for things such as pet-friendly, electric hookups, & laundry, among other things, so you can easily find what you want. But on top of the directory, it also includes more than 14,000 RV service locations, including towing, tire shops, truck stops and repairs. Oh, important thing here…pay close attention! Ready? IT COMES WITH FREE LIFETIME MAP UPDATES! That’s right. You will be able to get maps updated anytime by connecting the RV 770 to Wi-Fi and simply clicking on Updates. It will not only check for maps updates, POI, construction, etc, but also the firmware (software) that runs it. When you’re not familiar with the area, like we normally are for areas that we are exploring, it’s nice to have something to help you. So enter the TripAdvisor database! You can view ratings for points of interest, such as restaurants and attractions. You can look along your route or in the area you will be going. The Trip Planner tool, will suggest some interesting stops you may care to consider along the way. But wait, their’s more! In addition, the Foursquare database has also been included which includes millions more new and popular restaurants, shops, services etc. BTW…You can sync your Bluetooth-enabled smartphone to RV 770 and by doing this you get other added features. You can make hands-free phone calls, but then again, I think I would stick to my headset for there is noise in the coach unlike a car. BUT… you can receive “smart notifications” on the display. Whats that? Well, that means you can see incoming calls, text messages and calendar reminders without needing to grab your phone. But also, and I love this being a techie, it also offers voice commands! Say “voice command,” which I learned to do as you will see in the video, and then say the command. The RV 770 will then do what you asked without needing to take your hands off the wheel. I tried asking it to get me coffee and for some reason it then routed me to a Starbucks. 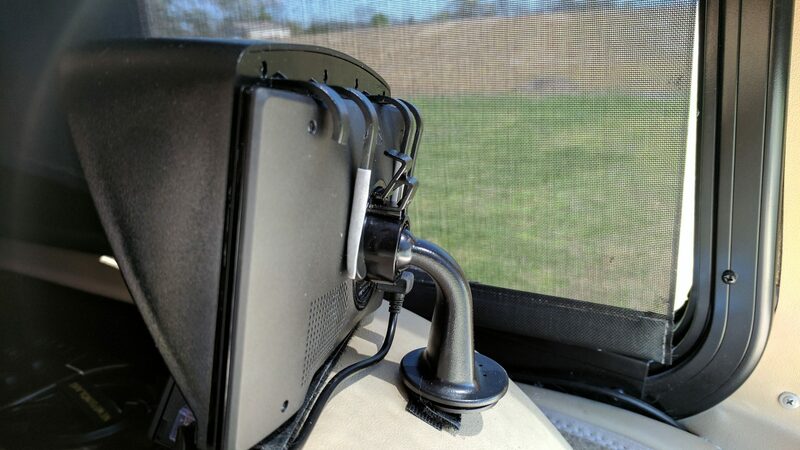 The Garmin RV 770 Mounted on dash of out 2014 Allegro Bus. I added the hood that I had from my other GPS which just happened to be the right size. However, the screen is bright, so likely not needed. Under it is a ScanGuage D which gives me more info on my engine than the dash board offers. To mount it I used the arm from the suction mount and added velcro to the bottom edge. Also you can see a thin strip of velcro added to the bottom of the GPS that mounts it to the dash. It may look like it would not stay put. But it surely does and so did my other one for years! So I can go on and on and on with all the features etc, but why do that when you really only want to know one thing. Do I like it? Would I recommend it? (Ok, Two things that are really the same when you think about out.) But YES…I do like it and I would and already have recommended it as it has been even added to our recommended items page. NOTE: Be it this GPS or any, we always will check the routes that we have not driven before with a Road Carriers’ Atlas made for large rigs. We will also use Google maps on a tablet/phone while driving as long as we have Internet data. Ok, now some of these are little things, while others we think really need some work. The good news here is that seeing it is all software, it surly can be improved with software updates. None of these are deal breakers as I know they surely will be improved over time seeing the unit is new. The RV 770 tells you are coming up to a State boarder, and shows an icon at the top right, but does not say you are crossing it. “Welcome to New York” would be nice as you cross into a state. We missed this from the other unit. It does not tell you when you crossing into a new time zone. “Changing Time Zones to Central Time”. We had changed Time Zones and did not know it until 4 hours later. This seems basic and just missed. No voice warning on things ahead that you should know about. Curve ahead. Construction ahead. Steep Grade Ahead Etc. It should SAY IT and not just ding. The ding can be missed. Anything important should be said out loud. When you have reached a WAY POINT, ie we had it plot to a Flying J along the way. It does not say you have reached it and then give you something you have you click to Continue on or tell it to move on to the next stop. (Incase the location is not spot on) It really mucked us up as we did not know it was trying to route us back to the same Flying J as it did not think it reached it yet. We had no idea what it was doing until it was too late. We had thought it had automatically moved on to the next stop or something. When you reach a point, it should show on the screen a flag or something and then give you options to continue to next stop or cancel route. When it needs to REROUTE, it is SUPER SLOW compared to the Rand McNally we were using. I do know that Rand McNally spent a good deal of time improving their speed of re-routes etc. We needed to be rerouted a few times and it was really bad to the point that we would miss the turn as it was not done yet and we had passed where it would want us to turn. It then would need to start the reroute again. Not sure on the logic it uses, but it seems it runs a full route calculation to the destination again vs just looking at a smaller segment to get you back on track connecting you back to the route. We feel this needs a good deal of improvement. We find they are totally waisting the screen space. It’s a nice screen, they should use it more. They give little to no information or things you can simply press on the map screen. We believe they should show things like what is the next exit coming up or even the current mile marker number. Some times you need to know what exit you just passed or what is the next one coming up incase you want to make a change. (Without needing to press something.) They could do simple things like Current Arrival Time and Remaining Miles on top of each other even in the same area as the font could be smaller. Not even a current compass heading. The more ease of use, the better. Give the user settable options of what to show on the map screen. Let people customize. The RV 770 really lacks user settable options when it should not in this day and age. With ANY GPS product you can having issues with mapping etc. This is why we check each route with a Road Carriers’ Atlas made for large rigs. Always drive smart and check things, as any GPS is not as smart as one would hope. PreviousWelcome To Our New Blog Look! Does it take into consideration the amount of propane you are carrying? Do you have any experience with Rand McNally? How does it compare with either the RM 7730 or their 8″ tablet? Yes and no. No on the AMOUNT as it would have no idea. Yes you can tell it you have propane so it knows and used it if it needs to. We are coming from Rand McNally which was a total pain to update and was slow compared to this. The Garmin RV770 asks you if you have propane and how many gallons of Propane you hold when creating a profile of your rig. Thanks for the review David. What method did you use to mount the unit to your coach?? Very slick going to get order one!! I got mine yesterday. All is like David stated but I have discovered it does not work with BaseCamp for downloading routes. I have contacted Garmin for a resolution. It’s BaseCamp for hiking? Not sure how that would work with a road GPS. Yah, that was my pet peeve with what I call, my Arch Nemesis, “Ms Garmin” as it would only take a few “Way Stops” and then you had to use Base Camp which I never really got, route it, then download it to “Ms Garmin”. So my question is, is there a limit on “Way Stops”, if so how many and is there a way to list “Rest Stops” without having to go into a menu.. like an option to list “Rest Stops” along the routing automatically… thanks. Thanks for the great review, enjoyed it..
Actually it’s great at both. It is a program that has a learning curve but once you master it you can do most anything any other mapping program does along with direct download to your Garmin device. When you update your GPS maps you can update the maps in BaseCamp at the same time so both maps are the same. I have use just about all the highway mapping programs over the years and now I use BaseCamp for on and off road along with Google Earth for previewing, all the other are gone. It is SO much easier and faster to do your route in BaseCamp than on the GPS. Exactly! We have the previous generation Garmin RV760 and we use Garmin BaseCamp to do all our RV route planning. It has an RV mode with the same height, length, etc. restrictions as the device. Then we plug the RV760 into the laptop via USB and transfer our routes. If the RV770 doesn’t work with BaseCamp that’s a show-stopper for us! Any word on whether the 770 will import Basecamp? Sorry, not idea as I do not use it nor have I looked into it. You may care to check with Garmin. I think BaseCamp was supposed to be the next mapping program after Mapsource for Garmin. I still have an old version of Mapsource on the computer and use it to plan our routes. I also tried BaseCamp, but really do not like it. Thanks for the review Dave. Looks like a worthwhile upgrade if our Garmin 465T unit ever dies. Your comments parallel my impressions, those being that Garmin does quite well with their hardware, but their software is somewhat lacking. As a licensed pilot and prior aircraft owner, I had experience with both. Something I’d be interested in, and not addressed here, is a comparison between the 760, and the new 770. I own the 760, and I need to know if the 760 includes enough enhancements to make it worth upgrading. Hi have a ? about this. Can you have it show you only RV parks you are a member of like Thousand trails and RPI WHEN MAKING A MAP TO A PARK? How loud is the speaker and is it clear when driving if I have my window open it can be very hard to hear a device? Can it work and still map if you have no internet at times? Can you have it show your clubs only…no. Voice is loud enough and I have it turned down some. Don’t know a lot of people that drive with the windows open based on the noise. :) Yes, it works without Internet. Internet is not even required as this is a full GPS with full maps, points of interest, etc. Regarding the suggested route being constrained by the rig’s height, length, etc… Does Garmin help drivers comply with California’s law that restricts 40+ motorhomes to just certain routes? Keep in mind the California laws apply to any coach longer than 40 feet true length, measured bumper-to-bumper, therefore all model-40 rigs. Supposedly the state has signs posted on allowed routes, which are mostly major freeways, and sometimes posted to show non-allowed routes, typically at freeway exists that can’t handle big rigs. But this seems random. It would be nice if a navigation system helped drivers roads that are forbidden by various laws. You would need to check with Garmin on that. Calf has really strange rules. Like if you are towing ANYTHING you MUST BE in the right hand lane. Not the middle of a three lane or even a four lane. Do they not think about entrance ramps and how much of an issue that can make for will all trucks and anything being towed needing to be in the right lane. Augh! You’re able to tow in the 2 right lanes under certain circumstances. When you tow a vehicle or trailer, or drive a bus or 3 or more axle truck, you must drive in the right most lane or in a lane specially marked for slower vehicles. If no lanes are marked and there are four lanes or more in your direction, you may only drive in either of the two lanes closest to the right edge of the road. Also, this may affect the 770, but the 760 has a glitch where it no longer shows the correct speed while towing in CA. When you tow a vehicle or trailer, or 3 or more axle truck, you’re limited to 55mph everywhere. The 760 will show the posted speed for autos, no matter what mode you’re in. So coming in from AZ to CA on the I-10, you can go no faster than 55mph once you cross the border. Unfortunately, the Garmin will tell you the speed limit is 70mph! I’ve been in contact with Garmin about this, but they’re lukewarm about it. 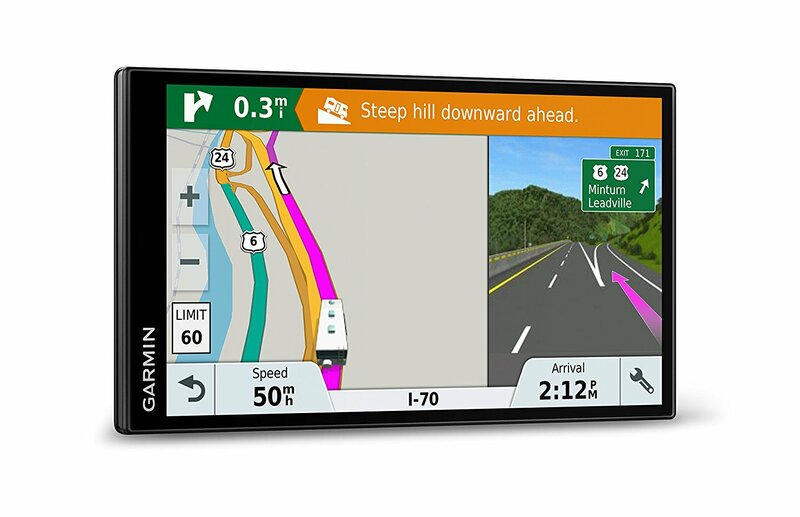 What do you like more on the Garmin vs the Rand McNally. One thing I like about the Rand McNally is that it shows your nearest highway exit number on the screen. Does the Garmin shows that? I am not to happy with Rand McNally due to numerous thing, but still think is a good unit. But, I am looking for a new GPS and saw your video. Now you got me wondering about Garmin again. Thanks for your videos. Safe travel!!! How’s the Garmin working out for you? I almost got one yesterday, but price still $$$ up there. I wanted to check with you before making any move. Can you export routes from GoodSams trip planner into the Garmin? Hi…Have not used it from the post we made as we are still at our seasonal site. I have no idea on GoodSams as I do not use it. Sorry I can not be more helpful. We just bought our first Class A Rv and need to find a good reliable GPS. Congrats! Not sure why you would use it that way, plan on getting lost? :) But yes, it has a where have you been feature. It shows you the history of your travels by date and you can click on it and see the map of it. how can it pick-up under the fiberglass roof above it. motor home is too boxy and can”t put under glass windshield ! Hi….There are MANY MANY GPS sats in the sky and this many angles. The signal has no issue getting to the GPS unit. Looking at the GPS Sat screen, I see it is using 14 sats. (Which can very) The more sats it can see, the better the positioning. Hi David, appreciate your efforts in your videos. I’m in the market for a GPS and have researching them. Can this one overlay data provided by third parties i.e. Low Bridges database? Supposedly that bridge data is more complete. And does it come with any suction or mount? Thanks! Have you used such data in any GPS knits? When planning a map to a location will it auto find your current location to start from? Like Google maps dose. Your presentation was interesting. The one feature I use, all the time, when traveling is the mileage marker display on our Rand McNally. I have never seen this on any Garmin and discussions I’ve had with Garmin indicates they do not include this with any of their GPS’s and have no plans to ever include this feature. My co-pilot keeps track of the rest stops and/or exit mileage numbers. By watching the mileage display we can tell how far we have to go and when we are getting close so we can be sure to not miss them when we distracted by heavy traffic or our vision is blocked by trucks. To me this is a must have feature. Other features I like about the RM that I don’t see on the Garmin is the mileage countdown. If our next stop is 305 miles away it’s nice to be able to quickly determine we are half way, 2/3 of the way or we have 58 miles to go. I also like the clock on the RM. Our dash clock goes away when our rear camera is on. The RM gives the names of cross roads when driving and I find this very helpful in areas I am not familiar with when looking for a camp ground to make sure I turn on the correct road. Some of the above features may be on the Garmin I just didn’t see them in your video. Thanks for the video, it’s always nice to keep up on as many new RVing tools as possible and your presentation was very enlightening. Travel safe. I am a experienced user of an RV760 and now the new RV770. You are correct that the Garmin does not show mile marker info however, for Rest Areas you can use the “Up Ahead” feature to display the next Rest Area along the active route. The “Up Ahead” feature on the 760 and 770 allow you to display three user selectable fields. The mileage countdown is one of 10 fields that can be displayed on the map screen. The road name of the next turn on the current route is displayed across the top of the map screen along with the distance countdown and direction of the turn. Tapping that area of the screen will display a complete list of all the turns, direction, and distance. David, after our email this morning 4-16-2017, I read your update. I hope you sent your update to Garmin. I’m taking your suggestions and making some comments. It’s long , but I think I have some fixes for you and maybe they can help others also. We discussed a lot of different things. In my comments below I hope I don’t mix up any suggestions I’m working on with Garmin and other projects. I think this is a little out of order from your post. I agree Garmin needs to address the issue of recalculating the route if you decide to stop for lunch somewhere, and when you start back up the device should take you back where you left off and not in a different direction from the restaurant because it thinks it’s shorter or faster. More on this below. Regarding the RV770 map display info. I think what you’re asking is how to display different data on the map while running a route. Try this: Settings, Map and Vehicles, Map tools, select Trip Data, exit. Back at the main screen run a route, (select a destination and go) select the wrench in the lower bottom right (after the route in running) select trip data, back on the map touch each window to select what you want to display in it. I also want a clock in the top right corner. Garmin needs at least one more window if you ask me, the smaller devices had four windows several years ago, when the screens got bigger we got less windows! These can be changed on the go while a route is running. Traffic delays or messages will pop-up over this window if necessary and you can close any of them at any time. The window on the bottom next to the wrench can also be changed. Touching the speed window on the bottom left will give you a whole bunch of nerdy trip data. When traveling and getting your next instructions, the amount of time before a voice command is a issue with every device I have had just exactly as you stated. You can tell the programmer never drove anything but a car. I always watch the upcoming lane arrow directions in the upper left corner that appear before the next voice direction, I hope the 770 has that also. I have addressed this with Garmin several years ago and was told at that time they could make an adjustment, but I never did it. I believe the device will always think you’re further ahead than you really are, so you will be told to turn before the road to turn on is really there. I don’t know if that still applies today. I didn’t follow up on that because I found I don’t need it when using Basecamp. Just so you know, I haven’t found one person in any Garmin office that owns or has ever driven a RV, in fact not one office even had a RV770 when I called to report the problems a week ago. One office did have a RV760, but those have been out for over three years and since they are very similar to the 770 one guy thought he could use that to simulate the problem – OMG. Everything works great on the RV760. He had no idea. The only time I have been rerouted is when I use the RV760 in my Jeep and then I don’t care. I have not had the RV770 on the road yet, and won’t until the BaseCamp issue is addressed. FYI, the RV760 works just fine in auto mode so I don’t need two devices. I don’t know about the RV770 in auto mode. Fixing your waypoint issue at a Flying J. When arriving at a Flying J, the POI’s on any GPS (or any third party including Flying J) are always located over the top of the store or in the street so they only get you close, and as soon as the device see you hit that spot it’s taking you to the next stop even though you haven’t even pulled in to get fuel yet. So I what that POI located 50 feet into the exact lane that RV’s need to turn into. In BaseCamp I click on the Flying J icon (or anything like a campground, Loves, TA, KOA’s) and BaseCamp instantly takes me to Google Earth to look at it and I see it needs to move 25 feet east. I move the POI to where I want it in BaseCamp and it’s done. It will always be there on my map in BaseCamp in a folder for Flying J’s forever, it even has a little Flying J logo on it. I can also select my entire route (big or small) and drive it in Google Earth start to stop. That’s also a good way to see if there are a lot of user photos posted around your route of something, it usually indicates something you might want to check out. Once you get BaseCamp set up just for you (which is all free) the only thing that changes are map updates, which are free with your RV770. You can do the 770 and BaseCamp at the same time, using Garmin Express and not use the built in WIFI on the 770. Basecamp is not a simple vacation planning program, but able to do very advanced things quickly once you know how. Everything you set up in Basecamp is kept for as long as you want, including your old routes. You don’t have to adjust POI’s each time you make a new route. I will be using two routes from my 2012 summer travels for this summer. I can create 33 campground stops in 7 months of travel this summer, almost 7000 miles, and know when and where I will need to fuel and in what places I can get in and out of, along with any low clearances (I pay for that subscription, because all the rest usually only cover main roads) mountain passes/steep hills, length restrictions etc and I’m two months away from leaving Florida yet…all in a very short time. Each driving day is a different route, and each destination already has some route for the Jeep that I want to go to. Those route and “attractions” display in a different color and use a Jeep profile and not the RV profile to calculate those routes, for on road to the store or off road. You requested your viewers/readers let Garmin know about issues they find. That’s very important, but explain why. 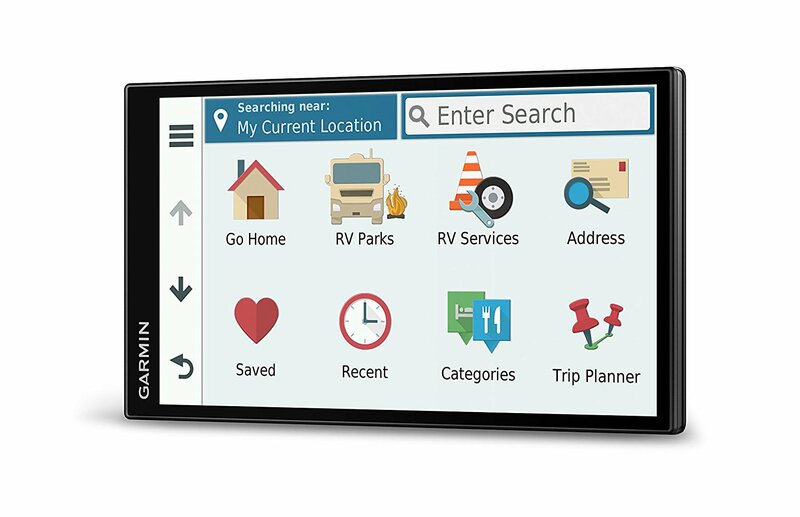 Garmin doesn’t understand what the RV industry needs, or the trucking industry needs. Adding a 3rd party list of campgrounds and a list of interstate “steep hills” to a auto GPS and making the screen bigger, doesn’t really make it on it’s own, there is too much still missing. In fact a big rig RV driver who is towing 4 down (Garmin doesn’t know what that is) has it more difficult than the 18 wheel driver, who can back up. Garmin doesn’t understand why that is. They don’t know how tow bars work or even what they are and why you can’t back up with them. So that is why Basecamp is so important for anyone that ventures further than the usual snowbird north south along the interstate. In those cases a smartphone is good enough. Thanks Jason for taking the time to write the above. I can only hope Garmin will listen and that enough of our readers will also reach out to Garmin. While you use BaseCamp, most people will not. As such, the GPS should do things you are needed to set in a separate program to get what you want. The idea of more or the screen is that they WAIST so much screen that they could be using for information the driver would like or need without the need to press something. (Look at the Rand McNally use of screen.) I surely have gone though all the settings, I can not get anything new on the screen, but I can add things to other screens that you need to call up by pressing at least one thing, but usually more than one. Oh well…I can only hope they really kick into high gear and make the 770 all it can be. Jason, you’re the first 770 owner I’ve run across that also has experience with the RV760. Would love to hear your thoughts on the improvements and value of the upgrade – here, or if not appropriate, some other forum you can direct me to. And David – thanks for the first impressions. Hi Ron, I think most of the features are the same as the 760, which has been out for three years. If you read above, you know I’m a long time user of BaseCamp so I can have now, what GPS’s will be like in the year 2525. I travel along, I don’t have someone reading a paper atlas for me. My GPS and my phone running WAZE is it. There is a out-of-the-box issue with the 770 calculating routes from BaseCamp, I have not road tested the 770 yet. Last night I reported to Garmin I had found the problem. The new RV770 allows you to add propane to your RV profile, but BaseCamp doesn’t have that feature, so the profiles don’t match and the 770 can’t calculate the route sent from BaseCamp. Removing the propane from the 770 profile, fixes the problem. Now that Garmin has that information a fix should be quick,, along with the other issues reported, like the Smartphone Link App with the iPhone that is reported not to work. So last night I was able to send all of my 45 summer routes (6000+ miles) (including 202 POI’s) to the device one after the other from BaseCamp and it calculated all of them in less than three minutes. That would be faster than the 760. A quick look at the new elevation feature on the 770 is not what I expected and looks disappointing, I’ll have to look into that more. I don’t use the traffic feature since WAZE is so much better, faster, free and tells you where the cops are. The WIFI updates will be good for those not using BaseCamp. BaseCamp users will need to keep using Garmin Express for updates so the maps on the device and the computer BaseCamp is on are the same, it also does the OS at the same time. I found the zoom on the map to be slow and you can’t move all of the icons on the screens to where you want, some are permanent unlike the 760. 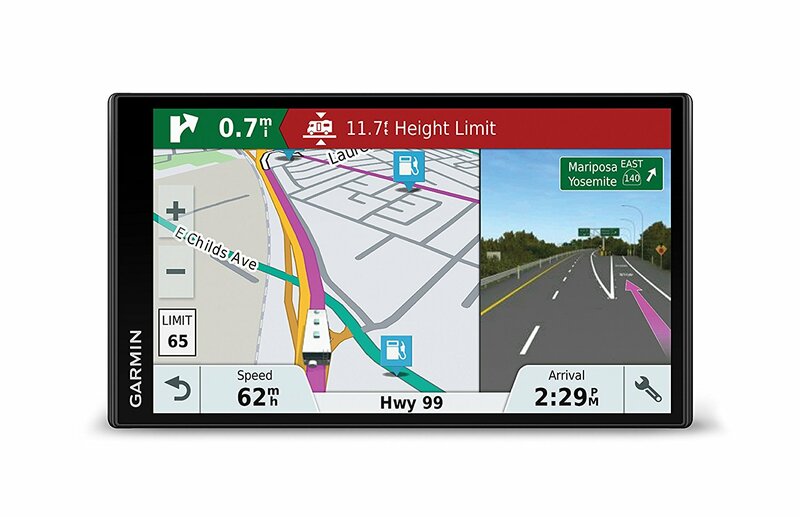 With past experience, going back to Garmin’s dezl device (for trucking before the first RV device was born) expect a few more bugs. 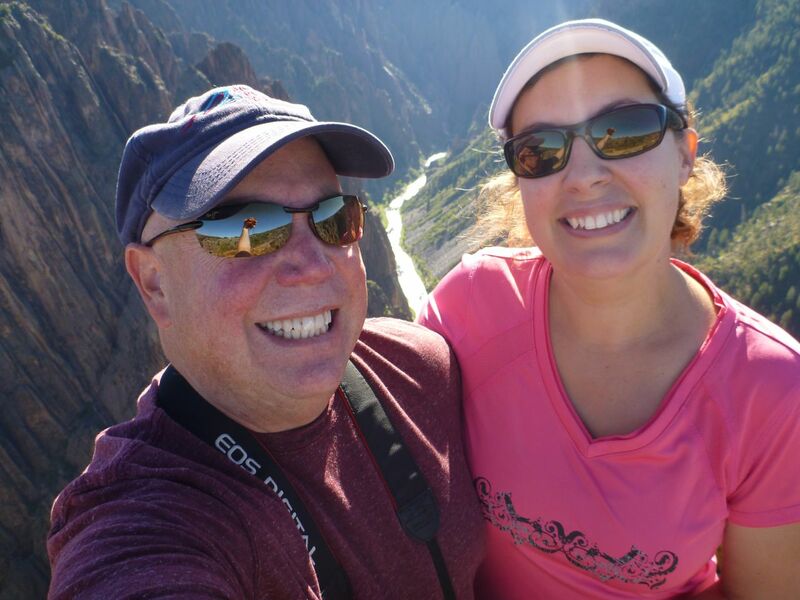 Just an FYI – I am talking with automotive about what a big rig driver (trucks and RV) needs as mentioned above, instead of purchasing third party lists of campgrounds that most of us won’t go into unless we read a review about them first. It’s a bunch of needless, outdated overhead on a device designed for navigation that doesn’t have or displays the needed information, unless you use BaseCamp, and that’s not for everyone. More bad news. I’m parked at Myakka River Motorcoach Resort in Port Charlotte Florida right now. I tested a route from here to Treasure Coast RV Resort in Ft. Pierce FL, almost straight across the state from me. Once I get on Highway 70 it’s straight across the state and once under the Florida Turnpike I turn left and into the campground. I’ve been there before. I ran the route five different way on the RV770 – selecting the street on the map and pushing GO, putting in the address, sending the POI from BaseCamp, selecting from the campgrounds listed on the device (it doesn’t know the US has a city called Ft. Pierce) and last I sent a route from BaseCamp. The BaseCamp route was the only one that didn’t take me past the left hand turn. The other four all calculated the exact same route taking me past my turn and put me on I-95 north to the next exit, then had me exit, turn around and go back south, exit back onto highway 70 (Okeechobee Road) then go PAST the road where I should have turned AGAIN, to the next turn on a smaller road that curves back around to the road I should have turned onto from the start and then to the campground. I wish I could post the screenshots here. Maybe you should hold off on this device for a while. Dave Thanks for the review. I have two big question, if you had to choose just 1 unit for rv travel what would you pick, Rand, the old 770 lmt, or the new 770lmt-s? Second does garmen really listen to what reviewers suggest and make changes? This is my first Garmin so I am not sure if they listen and make changes. One can only hope. I Rand McNally unit had it own issues, so it is a mixed bag. I will say that I like the Rand over the Garmin in regards to how they use screen space and also the speed of recalculations. But I had GPS issue with it over and over and the way you need to upgrade it is a joke. Hey Dave, I love your review on the video and I don’t know if I missed it or not but when entering you’re RV length let’s say it’s 45′ the tow bar is another 3′ and your vehicle is 16′ that would be a total of 64′. Is that correct or just add the motor home part. Same for the width of the motorhome – 8’6″ but that does not include the mirrors. Can Good Sam Trip Maker be imported? Sorry…Not sure…you would need to check with Garmin. I purchased the RV660LMT about a year ago in preparation for an extended trip from Ontario to the west coast and back. It replaced an older Garmin. I went with it instead of the 760 because the vendor said the 660 was the lastest model released. (GPS City) I understand it has a smaller screen than the 760, but it is much larger than my old Garmin. Generally I like the 660 but we did find a few times it mislead up, occasionally telling us a campground was on one side of a road when it was actually on the other side. I wish it would tell us how many miles or kilometers ahead the next exit is. We also found that according to the 660, almost every curve seems to be a sharp curve ahead. This is the forth Garmin unit I have owned and I’ve never tried any other brand. I generally like it but concur with you and Jason on some of the complaints noted. Hi Dave W, I have made several different side by side road tests with the 760 and 770. The good with the 770 so far, impressive fast calculation of some very complex routes from BaseCamp, the screen is VERY bright and sharp except when swiping, Ms Garmin is sharper and easier to hear and understand. Most important the device will route me (to my surprise and NOT using BaseCamp) on a better road (wider, less trees etc) when off highways and interstates, even if it’s a couple miles farther, than the 760 does, while both devices have the same profile and maps. Routing mistakes still happen on both devices without using BaseCamp, that’s not going to change on any device with any manufacturer. The device telling you to turn into the campground on the wrong side of the road comes from a list of campgrounds that the device manufacturer purchases from a third party. None of that stuff is checked for accuracy. The device user should always check the route with Google maps before starting. BaseCamp does that for you and will move the icon to the correct driveway for you. I would love to have distance to the next exit or a count of the Mile Marker also. POI’s are even very limited to add to BaseCamp for this. Garmin would need to add more data windows to the device for sure. I’m adding this to the want list for Garmin. The “Up Ahead” feature will tell you the distance and direction to the nearest whatever you’re looking for, just like saved places or when looking for anything in categories. That could give you an idea you’re getting close to an exit. 1-You can not sort a list of routes/trips on the 770 like the 760. 2-The auto-zoom doesn’t go in far enough when stopped or slowing down – I don’t know about that yet. 3-A good thing is the messages for “sharp curve”, steep hill”, speed change” etc, now also appear when in car mode unlike the 760. 4-The 770 is lighter than the 760 so the weight doesn’t cause the suction cup to fall off the window (so far). 6-I don’t know if multiple warning message now stack to the side until you pass them or not. The 760 would remove one warning message before you would get to the “steep hill” if it was time to give you another warning message even if you had not arrived at the first warning yet. You never knew how many more steep hills you had, I requested they be stacked and held until you were at the location. Touching the icon will repeat the instructions again for you, just like the turn-by-turn instructions, in case you have the music turned up to loud when she tells you. Florida doesn’t have any steep hills so I can’t test that until later this summer. 7-When starting from somewhere like a campground and the device doesn’t know the road in the campground, and you’re told to drive to the start or whatever she says…the 760 would pick you up as soon as it got you on a road it knows. The 770 waits until you intersect the route it calculated. In my case I’m in the back of this resort. The closest street is a housing development behind me. I can’t drive through the fence and across the people yard to get to that street. So by the time I go out the front gate of the resort and onto the main paved county maintained road that has street signs and that’s on Garmin’s map that Garmin uses to take me “home” on, it will not pick me up until I get to the end of that road where I would have come out of that housing development and intersect with the route it calculated a half mile down the road. If I didn’t know where I was going and it required me to drive around the campground and into some gated development development, that’s not good. So the device is calculating that route based upon my location. I hate to keep bringing this up because everyone just wants to push a button and have everything taken care of, but BaseCamp would have run that route starting at the front gate of this resort and there would have never been and issue. Garmin needs to fix this as well as the auto-zoom. 8-Can’t move icons on the app page. The last thing anyone wants as the first icon on a screen is the “Owner’s Manual” like your going to read that driving down the road, But it’s the first thing on the APP Screen and you can’t move it. Please post more suggestions and ideas. Getting stuff fixed and changed now is easier when it’s the center of attention. Great info David and Jason. The new 770 is also giving me problems when I try to “shape” the route. It keeps looping back around east and west on the interstate I was trying to avoid. I will try basecamp as Jason suggested. However, if I am already enroute and wish to go somewher else, I will have to use the shaping feature on the 770. Has anyone had any issues with the shaping feature. I’m looking at both the 760 and the 770. On the Garmin website it lists the 760 as discontinued. The price is $80 less. Not sure which is the best way to go with purchase. Hi Tina…I am Sorry, but I really am not sure as I did not own a 760. So it comes down to spending $80 more or not. Correction, it wasn’t Garmin that said it was discontinued, it was another site. What are the options for charging the units battery? Is it only with the vehicle cigarette lighter? It has a USB port on the back. I have not tried, but guessing you could charge it that way as that is the same port you use when you plug it in to charge. How do you delete the “saved” places that garmin preloaded? I am sorry, I am not sure as I would have had no reason to look to do so. The 770 can be charged via USB using the same rear connection power connection on the back. When a USB cable is connection you will get a message on the screen asking if you want to go into mass storage mode or something like that so you can connect to your computer for BaseCamp or just keep charging the device. Regarding deleting “saved” places. Select the saved places icon (heart) select the menu button in the upper left corner (the three bars) select delete saved places. Same goes for deleting routes/trips. It is my understanding that your options for vehicle in the initial setup are limited to motor coach, travel trailer or 5th wheel and there is no field where you can enter the information of a toad if you are in a coach pulling a car. This will create a serious danger for coach drivers with toads that cannot back up. Also, you answered one post above with the thought of only entering your primary vehicle’s length, weight and height information but this can be misleading when you are on roads in some state and national parks that allow a maximum length of your entire rig. Please research this and clarify. I stand by my comments in regards to what you enter into the unit. There are so many different things that people do or tow that it all can not be accounted for. This is NOT a replacement for the rules of the road nor would it, or should it, know all the rules of the road. It is still up to the driver to understand what is and is not allowed when driving in areas. But I for one still would like to be routed around bridges and weight limits that the database is aware of, and thus this is what the information is used for. 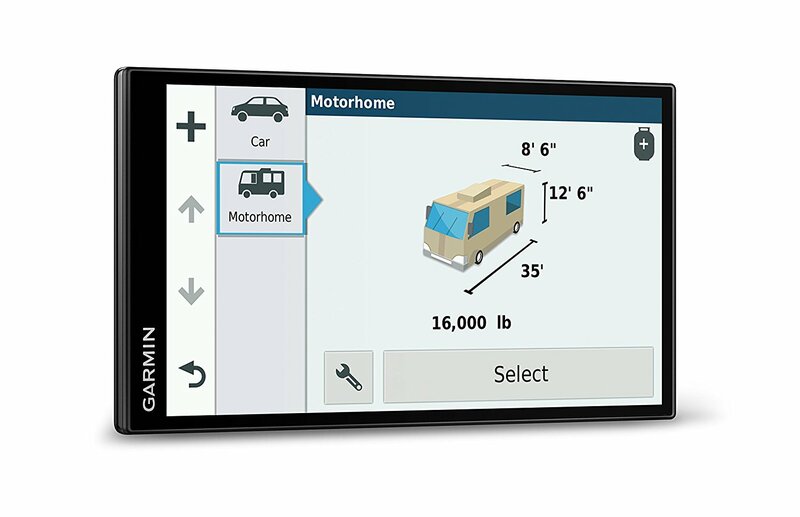 As far as Garmin goes, I’m sure David is correct that the device should only have the dimensions of the RV, even though the device should be intelligent enough to include the total combined length. No RV device does. I believe you will find that in the instructions. You need to look at each state’s DOT website before travel for length/weight restrictions or use additional software, when off the interstate. Oregon puts my 40 foot coach and Jeep over length, but because I’m a motorhome I go into another category and then I can go to 65 feet (or something) but still restricted on roads that are red on the restricted map, and I don’t want to be on any of those roads anyway. GPS’s don’t know that stuff and should, especially RV devices because we go out into the woods and trucks don’t. Once again you need third party software or keep checking websites. I had to use Google Maps as a back up. Those bugs have been around a long time. Basecamp fixes those issues except the speed limit. But the 770 seems to run you around the block more than the 760. Basecamp interfaces with Google Earth so you see everything, including Street View, before sending the route to the 770, using the same route the device will use to navigate you, preventing wrong directions, so no recalculating, low bridges (with 3rd party POI’s) and put you right into the parking spot you want, not 50 feet away. From what I understand (on any manufactures GPS) if the local DOT doesn’t maintain it’s reporting of the type/class of road, speed or changes to roads, like round-abouts being added, the maps won’t change. Garmin uses HERE Maps. Google uses a long list of suppliers for their maps, which I think are better. I have discussed with Garmin they add a button to the screen for all automotive devices, now that wifi is rolling out, that the driver pushes and instead of just the screenshot option you have now, it records all the information HERE Maps needs to look at that exact spot where the button was pushed to see what needs to be changed, instead of the very clumsy way you report problems now. Once the device is connected to wifi, all saved spots are automatically sent. Look for this feature in five years…maybe. The more comments to Garmin, the faster stuff happens. Making the device better, helps all of us. Fixes can be as simple as the next update, if Garmin feel it’s necessary. Make it clear it’s necessary. So if I’m looking to buy the best gps for rv would you recommend I buy the garmin 760 or the 770? Seems from reading around the 760 doesn’t have as many kinks to work out at this time? It’s a toss. The 770 has the new hardware but the software, the map rerouting speed seem to be the biggest issue. I have not owned a 760 so I can not compare it at all in regards to what it can and cannot to, or do well vs good. I have the same year and model coach as you. I actually liked the Kenwood unit mounted in the dash rather than another additional GPS. However, our in dash unit started going out when going over bumps and I think there is an open circuit on an internal board. Anyway, I am wondering why you did not mention your in dash unit for navigation as opposed to the 770 or other? It seems the coaches are coming with in dash units that are capable. Hi…The location is way to far away for me to feel comfortable to take my eyes that far off the road for so long. The unit is too small for the location distance. The unit is not made for RV so it does not taken into account low bridges etc. The unit can not be updated. There you have it. Thats about that. will the garmin 770 LMT-S do bluetooth audio out to make it better to hear. lot of complaints about volume not loud enough in a moterhome. For what? Phone calls? Yes. But still would be MUCH better off using a bluetooth headset. Also be sure to read about the issues I found with the unit in the video description if you have not. George H, if your asking if you can Bluethooth the 770 to the coach radio so you can hear the turn-by-turn directions, you can connect but you will only get phone calls, something I think is useless. I have also tried to connect the 770 to my cell phone which is playing music through the coach system (JVC) via Bluetooth, but you only have one option on the 770 regardless of what you connect to – phone calls. During the initial release, I complained several times about the volume level, always to be told it’s loud enough, even when I asked if they were testing it in a Class A diesel moving down the road. After an update, I noticed that the voice command is still lower than what I want and until you get to the spot where you have to make the turn or do something, then that command is louder. David- i am considering getting a 770. I saw your original video and your subsequent criticsms. Do you find in your new updates any improvements? I read they came out with a NEW users manual in october. Manual B. I did not read manual a. Yes all manufactures have the their issues it seems. Except that Garman biggest thing is wasting space. Totally wasting screen space that can be used for giving the driver information without having to press any additional buttons. To this day they have taken mine nor other reviewer’s comments into consideration and made changes. None at all. It’s still a wasted screen space with too many pushing buttons I need to be pressed to do something. For goodness six doesn’t even tell you when you’re changing time zones! Something as simple as that! I’m not sure what you’re referring to in regards to propane other than you enter it in there based on things like fairies, because because there are rules against bringing them on fairies etc. and the need to shut them off. This includes shutting them off even before going through some large tunnels. But any case, I’m not aware of any routing issues or what have you based on propane. The routing issues I have with it is based on recalculation speed which is really really slow. So, all of my findings still exist. I still use the GPS however because I bought one might as well use it in my other one died. But we surely back it up with Google maps as we travel. David-how does the 770 work for routes in car mode. More or less the same. But we usually used Google Maps in our car and only tired the 770 in it when we first got it as we were not moving for a little while. David-one thing i don’t understand is the free traffic for life. Do you need to buy the antenna for it? It gets it’s traffic info from the Internet. Thus it needs to connect to your phone via BlueTooth and the app on the phone gets the info from on-line. (At least that is the way I understood it.) For Traffic, we look to Google Maps as it is all in real time. :) Not sure what the HD Traffic is. So not sure on the last line. Sorry. Garmin support had me update Garmin Express which I have used in the past for my old Nuvi. Apparently Garmin Express does not update itself when it updates maps etc. The update is located from the Garmin Express main screen on the top bar. Click on the “Settings” wheel. Then scroll down to “About”, click and check for updates. The replacement 770 is also giving me problems when I try to “shape” the route. It keeps looping back around east and west on the interstate I was trying to avoid. I will try Basecamp as Jason suggested. However, if I am already enroute and wish to go somewhere else, I will have to use the shaping feature on the 770. The second time I contacted Garmin support about the shaping feature, I was told they do not have any further videos or instructions other than the very basic ones in the Manual on shaping your route. Has anyone had any issues with the shaping feature to change routes on the devise? We just got our Garmin Nuvi 770, and we need some help from some seasoned users. When using the Garmin Smart Link app on our phones, we are finding that it will only allow us to “Search Nearby Places,” which means we can’t find destinations along our route using the app (in this scenario, the passenger/navigator is using the app and sending the destination to the Nuvi unit being used by the driver) until we get within a nearby radius. Does anyone know how to change this?